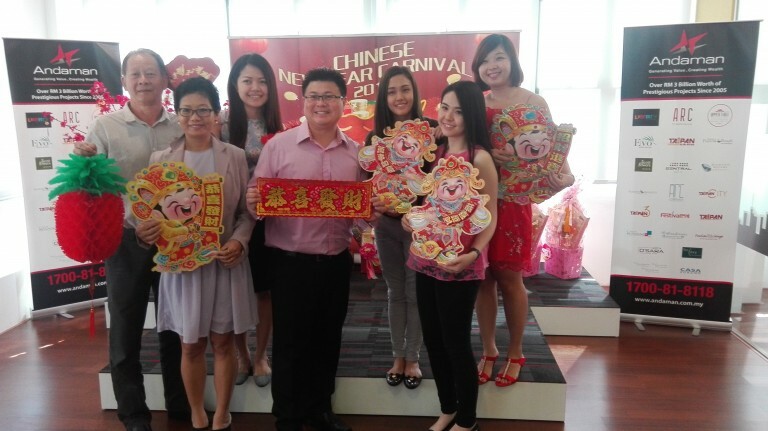 IPOH – Andaman Property Group is welcoming the Chinese New Year, the year of Fire Monkey with a carnival from Feb 9 to 11 at Upper East @ Tiger Lane Sales Gallery. Andaman’s managing director, Datuk Sri Dr Vincent Tiew said that the three-day carnival will provide a wide range of activities for all families in Ipoh during this festive season. “Andaman has invested more than RM100,000, and we want this to be a memorable and rewarding Chinese New Year celebration for property hunters in Perak,” said Tiew. Upper East Sales Gallery will open throughout Chinese New Year except for the first day. As part of the celebration, Andaman will be giving away CNY treats to buyers who purchase Upper East luxury apartment from Feb 3 to 29, 2016. A spin at the Wheel of Fortune will offer a chance to win cash rebates up to RM50,000. Upper East @ Tiger Lane features five blocks comprising 529 units in total with a choice of three internal layouts to cater for every need ensuring total comfort. The sizes consist of 1,162sq ft, 1,507sq ft dual-key units and 1,787sq ft duplex. The project is scheduled for completion mid of this year.